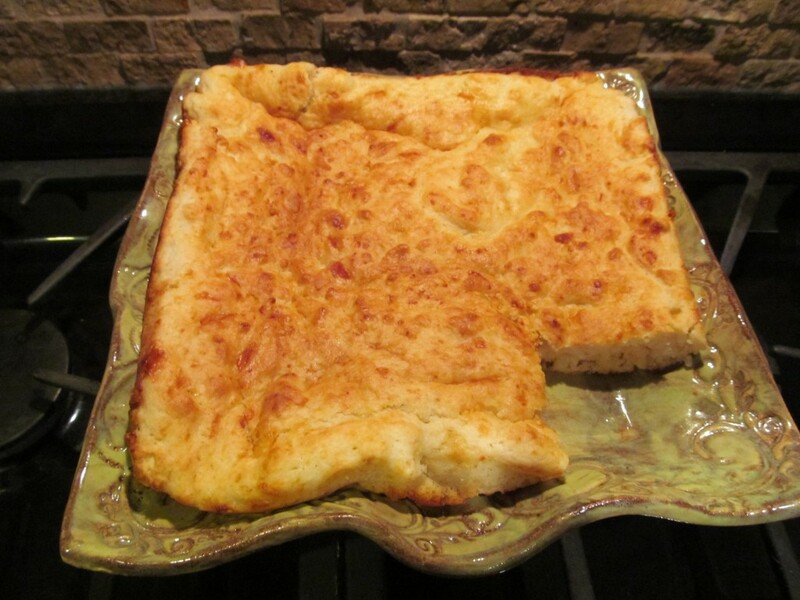 When I found this recipe on Plain Chicken for “Better Than Jim ‘N Nick’s Cheesy Biscuits,” I decided to skip the muffin pan and try making this in a 9 x 9 inch square baking pan. To be honest, I hate the cleanup of muffin pans and tend to make most breads in my cast iron skillet or loaf pans. This bread turned out beautifully, and my family raved over it! It tasted exactly like the biscuits you’d get at Jim ‘N Nick’s, but it was in a loaf rather than a biscuit! The size fit perfectly onto a lovely monogrammed plate that my friend gave me. This would also do well baked in a 10 ” cast iron skillet and served on a lovely round plate. I was hesitant to use the vanilla- fearing it would be too sweet- but it was just right. I used Cabot reserve sharp cheddar from Costco, which is extremely sharp, and it worked beautifully. The cheese had the right amount of tang to offset the sweet. Preheat oven to 425 degrees. Spray a 9 x 9 baking pan with butter flavor Pam. Mix all ingredients until blended, being careful not to over mix. Bake until golden, approximately 10-12 minutes. Spread with melted butter, and cut into squares.